SPQR: A History of Ancient Rome (Hardcover) | Eagle Harbor Book Co.
It’s virtually impossible to do Rome in one book, let alone make it informative and interesting, but the ever-impressive Beard manages it with aplomb. Ancient Rome was an imposing city even by modern standards, a sprawling imperial metropolis of more than a million inhabitants, a "mixture of luxury and filth, liberty and exploitation, civic pride and murderous civil war" that served as the seat of power for an empire that spanned from Spain to Syria. Yet how did all this emerge from what was once an insignificant village in central Italy? 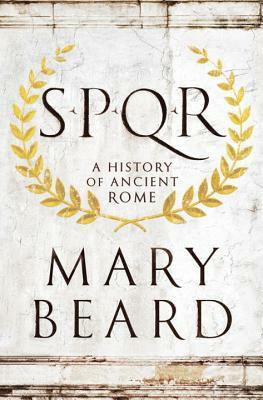 In S.P.Q.R., world-renowned classicist Mary Beard narrates the unprecedented rise of a civilization that even two thousand years later still shapes many of our most fundamental assumptions about power, citizenship, responsibility, political violence, empire, luxury, and beauty. From the foundational myth of Romulus and Remus to 212 ce--nearly a thousand years later--when the emperor Caracalla gave Roman citizenship to every free inhabitant of the empire, S.P.Q.R. (the abbreviation of "The Senate and People of Rome") examines not just how we think of ancient Rome but challenges the comfortable historical perspectives that have existed for centuries by exploring how the Romans thought of themselves: how they challenged the idea of imperial rule, how they responded to terrorism and revolution, and how they invented a new idea of citizenship and nation. Opening the book in 63 bce with the famous clash between the populist aristocrat Catiline and Cicero, the renowned politician and orator, Beard animates this "terrorist conspiracy," which was aimed at the very heart of the Republic, demonstrating how this singular event would presage the struggle between democracy and autocracy that would come to define much of Rome's subsequent history. Illustrating how a classical democracy yielded to a self-confident and self-critical empire, S.P.Q.R. reintroduces us, though in a wholly different way, to famous and familiar characters--Hannibal, Julius Caesar, Cleopatra, Augustus, and Nero, among others--while expanding the historical aperture to include those overlooked in traditional histories: the women, the slaves and ex-slaves, conspirators, and those on the losing side of Rome's glorious conquests. Like the best detectives, Beard sifts fact from fiction, myth and propaganda from historical record, refusing either simple admiration or blanket condemnation. Far from being frozen in marble, Roman history, she shows, is constantly being revised and rewritten as our knowledge expands. Indeed, our perceptions of ancient Rome have changed dramatically over the last fifty years, and S.P.Q.R., with its nuanced attention to class inequality, democratic struggles, and the lives of entire groups of people omitted from the historical narrative for centuries, promises to shape our view of Roman history for decades to come.